We had to take our video offline for technical reasons. 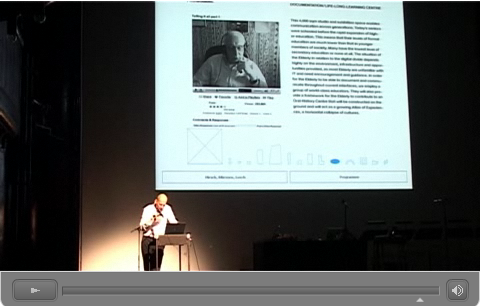 Please refer to Fred Plassmann´s nicely shot and edited clip at architekturclips.de - it´s somewhat shorter but you´ll get a good idea of the presentation. In there also some uncredited stills from the Great Pyramid documentary that will be out in cinemas later this year. For the files: A thousand individuals from about 50 countries have made an unbinding reservation for a stone in The Great Pyramid as of yesterday. This number is growing by one or two dozens a day at the time. Thank you all! 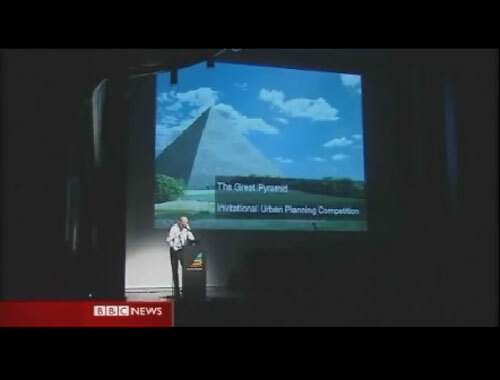 The Great Pyramid made it into the BBC World Service TV news. 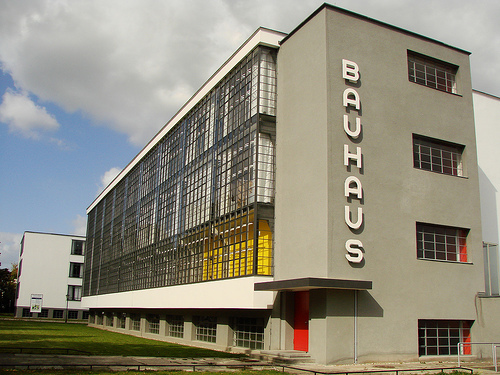 With due hesitation the BBC notes the fact that nothing is being built yet but luckily avoided the „German pyramid“ punch unlike in last September´s radio coverage. We´re making some headway it seems..
Here´s the article and there the video we´ve sacrificially shot Monday morning on this wind-swept field near Streetz where Tristana, the BBC Berlin correspondent, managed to find the by far saddest looking view of the small town for her moderation. The Great Pyramid also made it on the frontpages of Dutch daily De Pers and PolishDZIENNIK, was featured in German major national daily Sueddeutsche Zeitung (not online), was on 3sat Kulturzeit once more and has been covered by German national public radio Deutschlandfunk (listen or download). Thinking of all the image requests from print media we´ve replied to, we guess there´ll be a bit more out very soon..
It´s been quite a night. Musical performances, presentations of previously unpublished aspects of The Great Pyramid and lots of interesting conversations at the aftershow. We know we could have done one or two things better but eventually everybody we talked to was most fascinated by the Gala event. 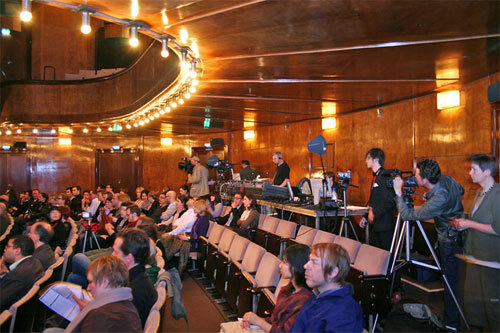 It´s been an adequate closing of last years activities funded by the Federal Cultural Foundation of Germany. The Great Pyramid has finally evolved from a conceptual art project into a serious venture. We´re happy and also somewhat relieved that now everybody is convinced The Great Pyramid project will finally be implemented. The major news of the night were the submissions from our architectural competition and the announcement of an international location tender. The designs are being uploaded to the website, the location tender document will follow next week. Although some media still prefer to call it „the German pyramid“ we made it absolutely clear that the location is not yet defined. The Great Pyramid will need to be built in a place were it is welcomed by the region hosting it – but above all will have to follow the preferences of all the people who will make it part of their lifes and afterlifes. In simpler and more business-like terms: It will be built where it works for customers. 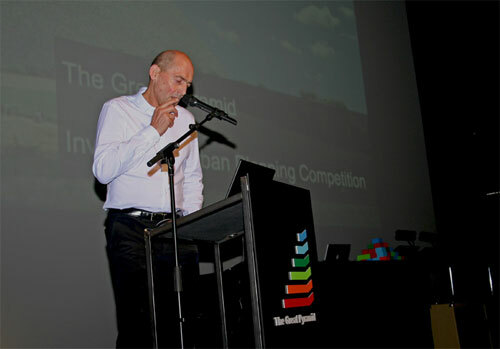 Thanks to Rem Koolhaas for coming to Berlin and presenting the competition results despite of an extremely tight schedule, to all the musicians, René for the zero budget stage decoration concept, Lars for implementing it, Christian von Werner for taking photos, Simon for filming the whole show and everybody at HAU for their most professional technical handling of the event. For those who haven´t been able to attend the Gala we´ll make some simple, unedited video footage available later today or tomorrow. 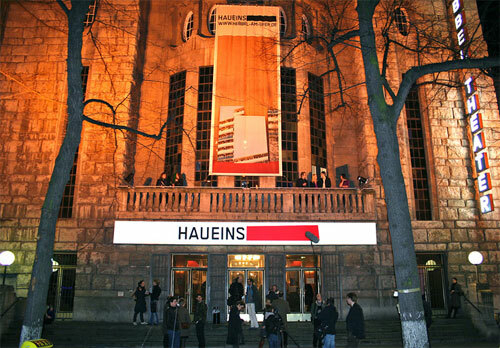 We will be presenting the architectural competition designs and discuss the Great Pyramid project at the Bauhaus Dessau at 7:30 p.m. on Wednesday, March 12, 2008. 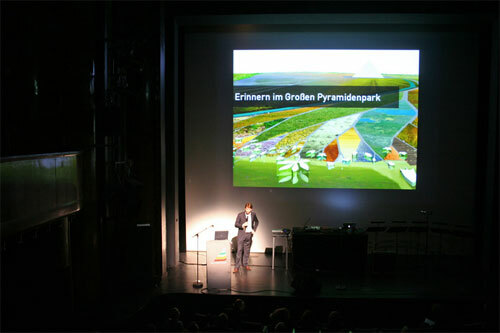 Ingo Niermann, Friends of the Great Pyramid e.V. Jens Thiel, Friends of the Great Pyramid e.V. Sorry, we´re to tired to write a decent Gala post after Stefan, Alex and I relaunched the website. Thanks to everybody who was there, promise to do a bunch of things much better next time and also promise to fix several voids and aesthetically challenging features of the new site very, very soon. 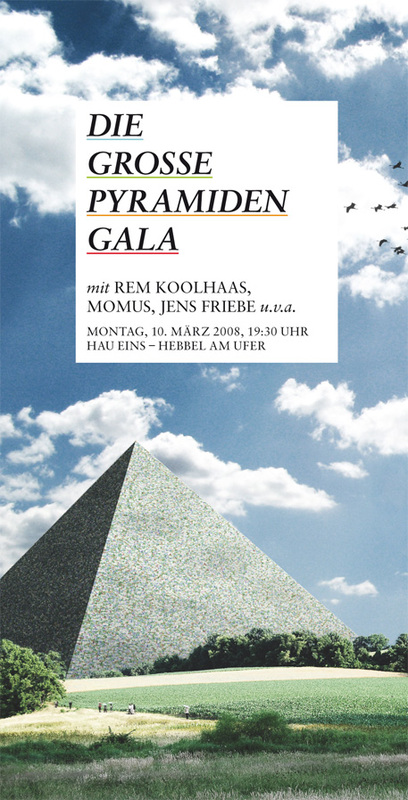 Please check the post in Momus blog where you´ll find a video clip of his fascinating performance, a couple of images from the Gala and some background on where the Great Pyramid project originally started. It´s been a long way out of ironic hell..
Feel free to download and forward our flyer for the March 10 Great Pyramid Gala in Berlin here. The full lineup is on the back.